Compass Project a not-for-profit social enterprise founded and operated entirely by people with a history of drug/alcohol dependency and offending backgrounds. Completely changing ones life is something that takes enormous courage and heart. We are proud to be in recovery and want others to find the same joy. We raise the majority of our funds through our two 2nd hand stores and restoration workshop. All monies go back into the project to help and support our members address behavioural issues and develop core work skills. Everyone involved in the project is given the responsibility and the trust to work at the stores on a voluntary basis and take advantage of this unique environment of shared personal experience and identification. This gives us the time we need to address the barriers we face when attempting to transition back into society after a life-time of addiction and crime. This also allows us to develop new skills, practice old trades and gain experience and references for our eventual employment. Once the working day is done, we organise social events to renew hope that we can find fulfilment in sobriety. We collaborate on creative projects to once again feel inspired. We are a family and we grow together. Our members (especially the ones with offending backgrounds) rarely engage fully with the rest of society due to deep seeded trust issue and a feeling that they are being judged due to their circumstances. We offers our members identification and an informal setting that allows free communication about the real issues they struggle with. Feelings of marginalization and fear are slowly replaced with feelings of solidarity and possibility. The first step towards seeing change is being realistic about our goals. Many of our members have never had to follow simple rules let alone maintain a structured lifestyle. Special attention needs to be paid to fundamental life skills: time management, following rules, taking direction, personal appearance and communication. We need to be given time to adjust to what, for us, are massive behavioural changes. The most crucial part: addressing confidence, self esteem, motivation and mindsets (especially related to our attitudes towards work and the community.) This is achieved by allowing us to experience- in a drug free/sober state -what actually happens when we are confronted with challenging work situations and interactions with the wider community. Julian started as a volunteer at Compass when it was still a pilot project. He quickly moved up to manager of our Gloucester Road store and then wore multiple hats over at our Staple Hill Branch. Julian spend the better part of 40 years in addiction. Until he joined the Compass Project, Julian found it very hard to manage his erratic life and achieve emotional balance. Being in recovery was the first step for him but he needed something more to help him build structure and focus – things that had always been challenging for Julian throughout his life. Through Compass Julian has learned to focus and manage his emotional well-being. He takes great pride in the work that he does and he is an inspiration to others around him. He is always eager to help new comers and share his experiences. Julian recently left the project and moved to Scotland. He is raising his baby daughter there. He has been clean and sober for over 5 years. This video was recorded over 4 years ago when Nigel had first found the project. Since this filming Nigel has continued to build his life. Compass helped him get his driver’s license and he stopped being the van ‘boy.’ In time he moved all the way up to general manager of our Staple Hill Branch. He has contributed immensely to this project. For a very long time Nigel’s children did not have any contact with him. They are now in his life. He sees them, and his grandchildren, on a regular basis. He has his own apartment. He has been clean and sober and has not re-offended in over 4 years. Alex found Compass when he was 24 years old. He had spent the last 10 years of his life using and going in and out of prison with multiple convictions. 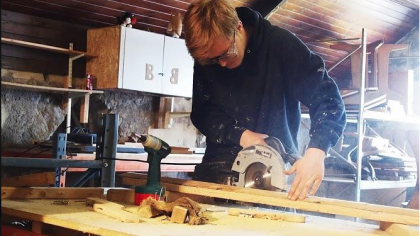 Despite being a certified trained carpenter, Alex was never able to hold onto any job for long – always falling back into addiction. Just before finding Compass he had completed an intense 6 month treatment program and he felt more hopeful about his future then he ever had before. But a few months after joining he fell once more into addiction. But this time things were different – he had the support of the Compass Project. Things were hard for a while but Alex kept coming back and spending time at Compass occasionally. He would spend time in the workshop to help deal with boredom and the desire to use. He did not feel alone for the first time in his life. Slowly Alex got back on track. Compass helped him hone his woodworking skills, helped him gain his confidence and self respect back. When he was ready the project helped him get his driver’s license and set up his own business. Today Alex is a self employed carpenter and has not used or re-offended in over 3 years. He has a new family and lives in London.